Why does my hip joint hurt? There are a variety of conditions that can lead to hip joint deterioration resulting in pain, reduced range of motion, and decreased quality of life. The human hip is a ball-and-socket, in which the ball of the femur (thigh bone) fits into the socket of the pelvic bone. Like other free-moving joints, the hip contains a small amount of synovial fluid, which lubricates the joint whenever you move. It is held together with ligaments – straps of tough tissue, which help prevent the joint from dislocating. Full function of the hip joint depends on the successful coordination of many interrelated parts including bones, muscles, tendons, ligaments and nerves. When the cartilage in the hip joint is damaged or wears down, the bones begin to rub together – resulting in friction, pain, and even bone deterioration. 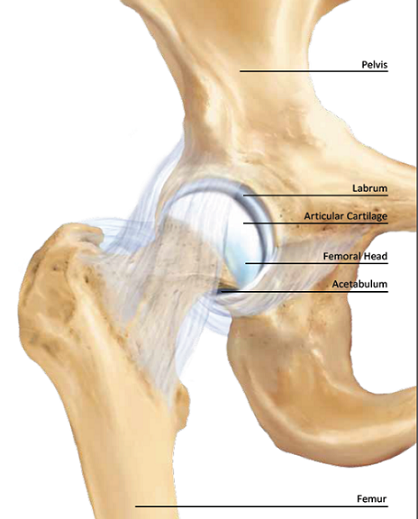 Worn cartilage is typically associated with arthritis, or osteoarthritis, the most common type of arthritis leading to total hip replacement. An orthopedic surgeon may recommend Total Hip Replacement because of osteoarthritis or other forms of arthritis such as avascular necrosis, inflammatory arthritis and traumatic arthritis. A severe hip fracture or dislocation (often caused by a fall) may also require a Total Hip Replacement. Accident, injury and age can damage the hip, limiting its flexibility and making movement painful. The hip joint is basically a large ball-and-socket joint composed of two parts: the head of the thighbone, or femur; and the acetabulum, a cup-shaped bone in the pelvis. During hip replacement surgery, damaged portions of the hip are replaced with smooth, durable artificial surfaces to allow the joint to function properly. During Total Hip Replacement, also known as hip arthroplasty, both parts of the hip joint are removed and replaced. Usually, a titanium cup with either a ceramic or polyethylene insert, and a ceramic or metal ball replaces the femoral head, and a metal stem is inserted to connect the ball with the bone shaft. Soft Tissue Preserving Surgery does not necessarily mean a shorter skin cut. It is more about the protection and preservation of soft tissue, muscles and bone. 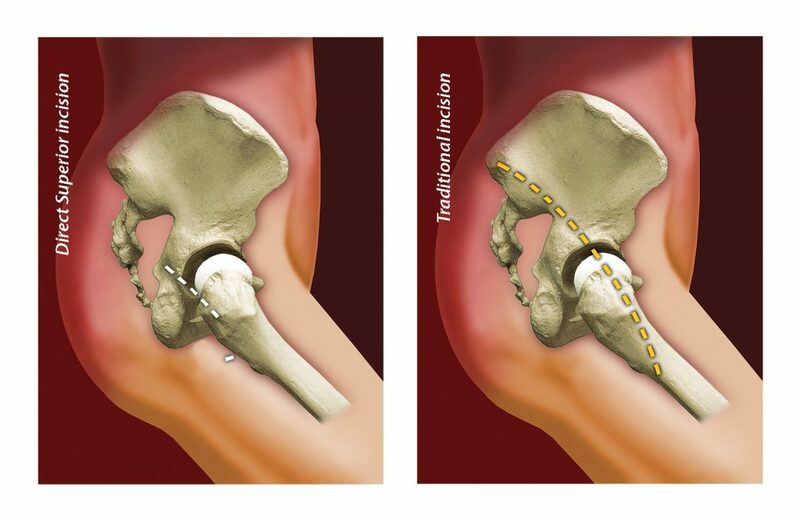 Upon this principle your surgeon will use the appropriate approach and implant for the total hip arthroplasty. Your surgeon may choose a soft tissue preserving approach, discussing benefits and risks. 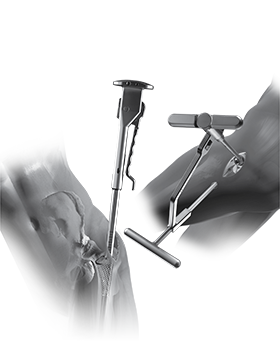 Based on your case history, your surgeon may recommend a specific design or material for the new hip. Depending on your lifestyle, your surgeon may decide to use a cemented or un-cemented prosthesis. Without cement, the bone has a better chance of growing into the roughened hardware. The cement used with cemented hip implants has a better chance of fixation in osteoporotic or weaker bone. Surgeons perform total hip replacement surgery using various surgical approaches, taking into consideration their preferred surgical style as well as what will be the best surgical technique for their patient. The direct portal assisted total hip approach is a soft tissue sparing option for total hip replacement. The surgical technique for a direct portal assisted total hip replacement was developed as an advancement to traditional total hip replacement, it aims to get patients back on their feet within days (possibly hours) instead of weeks or months. A number of patients who have undergone this procedure are able to walk unassisted the day after surgery, and leave the hospital without the typical restrictions (such as crossing their legs) associated with total hip replacement. With the direct portal assisted total hip approach there is no surgical dislocation of the hip. Patients can also have as little as a 6cm incision. It is important to understand that “less invasive” does not only refer to the incision but also means less trauma to the muscles and tendons under the skin. A direct portal assisted total hip approach is designed to precisely reconstruct the hip without cutting critical tendons and stretching or traumatizing muscles that are important to hip function. Because of the elimination of damage to these important structures during reconstruction, patients typically have a short hospital stay and a number of patients walk the same day as their surgery. It is important to start moving your hip as soon as possible after surgery to promote blood flow, regain motion, and facilitate the recovery process. There are certain activities that will occur in the hospital as part of your recovery. In addition, there are some activities that you need to perform at home to ensure a successful recovery. While in the hospital, a physical therapist will teach you how to move with your new hip. This includes how to safely climb and descend stairs, how to get into and out of a seated position, and how to care for your hip once you return home. The physical therapist will also show you a variety of exercises to help you regain mobility and strength. It is important to properly care for your incision site. Avoid getting the wound wet until it has thoroughly sealed and dried.